Every human has a need to make music and this need can be fulfilled together with the children we mind for so that their need to express through music is also fulfilled. The musical taste is formed early in life so it is of importance that we provide an environment that is rich in beautiful music and high quality non-plastic percussion instruments. This will accustom the child to the best of musical sound. I have collected quite a few different kinds of instruments for my children. Sometimes the instruments don't work as intended. The sound is not beautiful or it is much too loud. I once bought a bell stick instrument with a huge number of bells that was way to loud. I plan to take it a part and make many smaller versions with just a couple of bells on each stick. I have not yet purchased an instrument that my children can not handle but that would be another reason to put them away. 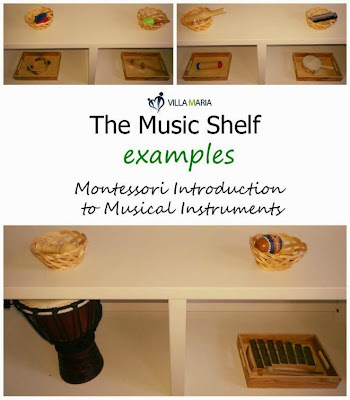 List of Instruments to rotate on the Music Shelf: Here is a list of possible musical instruments that work well for toddlers. Try to find the smaller size of instruments that would fit the hand of the child it is intended for. Always purchase the real instruments and avoid the toy and plastic versions. If money is a factor, buying one quality musical instrument is better than a houseful of cheap, second rate, pretend ones. You can tell that most of the instruments are percussion instruments due to the children's movement ability. The instruments are not put out all at once. It's a list for rotation. Each instrument is stored in a bag individually. If you have a xylophone of some kind, it does not go into a bag. The Individual Presentation: Invite the child to the Music Shelf. Present the instrument you want to show him. "This is a maraca". Ask the child to get the rug and then show how to carry the basket with the instrument. You will have one instrument for yourself and one for the child. "This is a maraca. This is how you hold the maraca. You can play the maraca like this. Shake and Tap". 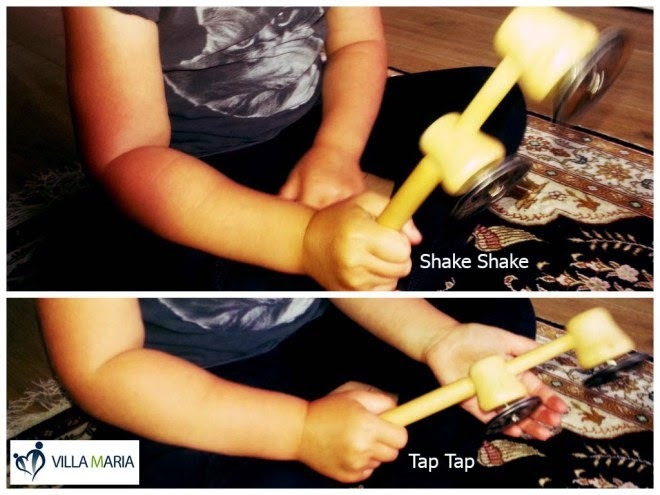 Shake the maraca, say "Shake, shake" and then tap the maracka against your hand, say "Tap, tap". Now you can sing a song while playing the instrument. You can make one up. "Shake shake. Tap, tap. I play my maraca". Keep going with the lesson as long as the child is interested. When the child has had enough you ask the child to put the instrument back in the basket, roll up the rug and put it away. My daughter doing the shake-shake, tap-tap with a tambourine stick. Maria is a teacher and trained Montessori Guide for ages 3-6 and 6-9 and trained Assistant for 0-3, from Sundsvall. She has a three year old daughter and a one year old son and all three work at the local Montessori School. The husband and father is a carpenter and builds the Montessori Furniture needed in the home. Maria blogs at Villa Maria Montessori - The Montessori Guide and can also be found at The Villa Maria Facebook page. 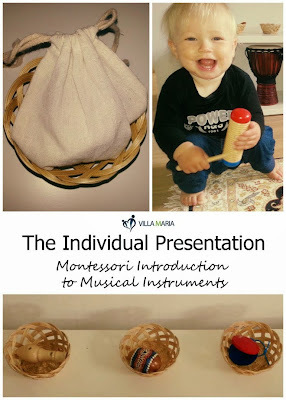 Want more toddler Montessori? Click here to read more posts!